Two security guards have been jailed for their part in a £7m staged robbery at a Heathrow Airport depot. Loomis employees Mohammad Siddique, 32, and Ranjeev Singh, 40, claimed they had been robbed to cover their tracks after they stole 26 bags of cash on 14 March. 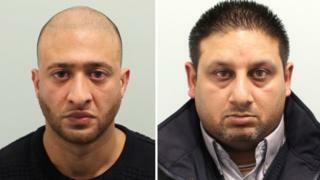 Siddique and Singh were each jailed for six-and-a-half years for conspiracy to steal at Kingston Crown Court. A third man, Rafaqat Hussain, was jailed for 10 years and three months for organising the raid. Hussain, 41, helped to organise the crime, and prosecutors believe he had been tipped off by an insider. The court was told that after driving from the depot, Siddique and Singh reported their van missing. Siddique was later found bound by cables on a service road near the M40 in Buckinghamshire, with the van abandoned and the cash missing. The two security guards made it appear they were victims, but phone records showed Siddique had been in contact with Hussain and Singh. Secret recordings made by a device planted by police in Hussain's car caught him admitting, "I had all the cash, £7m", and boasting that he could buy any car he wanted. He said: "I want to lie low, I could buy a Ferrari, I want to chill for about six months, buy a couple of houses, flip them and make a bit of money." Siddique, of Belgrave Road, Slough, and Singh, of Grampian Way, Slough, had previously denied one count of conspiracy to steal, but the jury found them guilty. Hussain had pleaded guilty to conspiracy to steal, money launder and commit burglary. Sentencing the men, Judge Stephen John said: "You each played for high stakes, and must now pay the price."